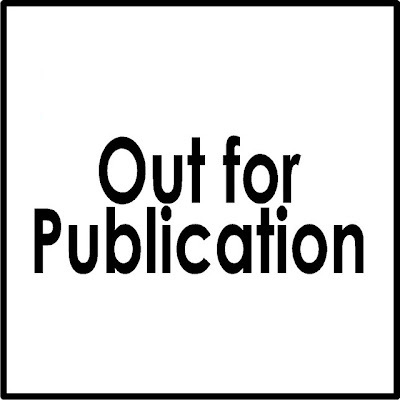 I just received an email today that two of my LO's are going to be published in the June/July issue of Ready, Set, Create! I am pretty excited because I have never had anything published before and now four things in one week. I just uploaded the Happy LO and now have to take it out for publication! Frances turned 4 months old yesterday! Wow, time is really going by fast. I can't believe how big she is already! We took her yesterday for her four month check up and she weighs 14.5 pounds- the 96th percentile! She is such a little chunky monkey. The doctor said I feed her too much and if she's not hungry, don't feed her. Ooopps! What can I say, she likes to eat like her mommy. My husband calls her legs elephant trunks. She also needed her shots and didn't like that one bit. Around 4pm she started crying and I gave her some tylenol. She just layed on my lap the rest of the night making all kinds of sad sounds. My heart was breaking for her. I kept saying "mommy why do my legs hurt?" I figured that was probably what she was thinking. I also finished two layouts from sketches from 52 weeks, 52 sketches. I am lovin' the sketches. They are so fun! Both are of Frances's 3 month pictures. I can't believe she looks so different already! Journaling says: There's not enough paper and there's not enough ink to write all that my heart wants to write about you. I also tried using some beads on the layout. I used diamond glaze to glue them to the accents and double sided tape to put the strip below the pictures. Thanks to Jodi at 52 weeks, 52 sketches for her great bead tutorial! Journaling says: When you laugh, when you smile, even when you cry. Your chubby cheeks and the dimple. The creases in your arms and legs. Your beautiful brown eyes. The way you look at me when you wake up. Everything about you makes me so happy. 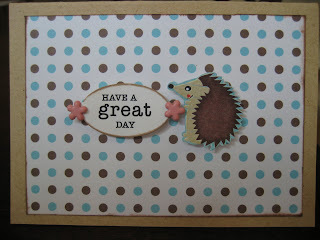 I just received an email that two of my cards and going to be published in the May issue of Scrapbook News and Review! I was so excited! I have been working on some new LO's of dear Frances that I will post this weekend. It is supposed to be over 80 degrees here this weekend, I can't wait. Hope everyone has a great weekend! Spring finally arrived in Chicago! It is 70 today and expected to be 80 tomorrow. Finally! I can not wait to get outside with Frances. To celebrate spring come to the Scrap That forum and submit your spring related layouts for the Spring Layout Contest. What a great way to celebrate the warm weather! I created the flower by layering some left over making memories tags I had laying around. I inked around the edges and stamped a little design all over them. You could make the same thing by punching tags out of patterned paper or cardstock or even cutting some rectangles out of your left over scrap paper. Layering some different sized rectangles with all different patterns would be interesting. I think I am going to try that. What a great way to use up my scraps! I have heard everyone talking about sketches lately and how great they are. So I thought- I have to try one of these sketches out. I went over to the site 52 weeks, 52 sketches and looked at some of the sketches. I settled on sketch #15 since it was the sketch of the week and and I could upload my LO to be entered into the weekly drawing. I loved using the sketch to make this layout. It was nice to have everything layed out and not have to think about where to put stuff. I only had to decide on the paper and embellishments. Since it was a park LO I wanted to use some fun, outdoorsy, cute papers. Of course I had to use my DCWV Green Stack! Have I mentioned how cute that paper is? 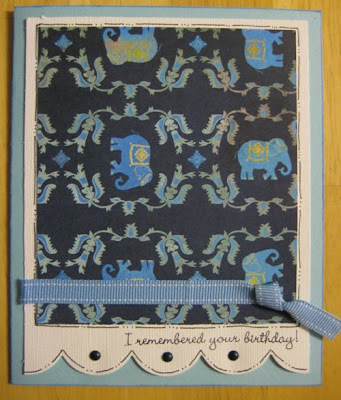 It has such cute animals and flowers and designs on it that you really don't need that many embellishments. I cut the branch out of one sheet and then cut 2 x 2 squares to make some cute embellishments for the side. The paper was so cute I didn't want to take away from it so I just chose some simple buttons. The buttons in the shape of flowers are so cute. They are from the Autumn Leaves big bag of buttons. I just revealed the pages made with my DT kit from Scrap That! this week. This month we were given papers and embellishments from Basic Grey's Marrakech line. I have to say the patterns are not really my style, but I have been inspired by them! It was nice to challenge myself with patterns and colors I usually don't use. Looking at all my layouts I always use stripes, polka dots, flowers or cutesy animals. And I always use pink! Always! So here is what I came up with- My first page is titled "HUH?" I instantly thought of that title when I saw my DD's face in this picture. She has the funniest experessions! It cracks me up. When I posted it at Scrap That! someone made a comment that I had a cute little guy. They thought she was a boy! Boo! That's ok, I did use black and blue papers. Of course I had to put my own touch on the page by using some pink bling and pink polka dots. The polka dot paper is from the Sassafras Whale of a Tale paper pack. I love that pack. It is so fun. I love this layout. It may be my new favorite. It was pretty easy too. You gotta love that! The journaling reads- "I talk to you all day long Frances, but you just look at me with this look on your face that says HUH mommy?" My other DT reveal is "Wonder". I took this picture on a trip to Arizona in 2006 and for some reason the paper reminded me of it. My husband looked at it and said "This is morrocan paper, not southwestern." I know but I still thought of this picture. This is completely not my style so it took a lot of second guessing while I was putting it together. My favorite part is that brad flourish. I am definitely going to try one of those again! It didn't take as long as I thought to make it either. I stamped the brads with Stazon ink to match the paper. I think it gives the page a finished feel. And Saturday I will be going to my monthly crop. So I will have lots of new goodies to post! It has been a pretty busy week around here! We had Easter, then the taxes are due (dh is finishing them right now!) and Frances's baptism is Sunday. I did find some time to scrap though. At Scrap That! the DT's all posted a challege. One was to use something recycled and green on a layout, one was to use stamping on a layout, and one was to scraplift a layout. So I cheated and used completed all three challenges on one layout! Probably not fair, but I was inspired. I had the idea in my head for this layout long before I made it. It turned out better than I thought. I wish I would have centered the title better, but that's me, just forging ahead without planning. It would take me way too long if I measured everything! For the recycled part I used the packaging from my MM letter stickers. It looks like a ledger sheet! I stamped the flourishes and title and scraplifted little things here and there from the Scrap That gallery. Seriously you should look at the packaging from your scrap supplies. Now I always think what I could do with the stuff before I throw it away. 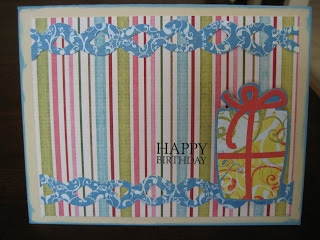 Great for making a card! My next challenge is to work on my DT layouts as soon as the taxes are done! I hope everyone had a great Easter! I was feeling a little sick yesterday, but that didn't stop me from eating tons of desserts! It was such a fun day. When Frances woke up we took some pictures of her in her Easter Bunny pajamas. She wasn't really cooperating. I think she was still a little cranky! Then we gave her her Easter Basket. There were lots of toys and books in it (no candy yet!) and dressed her up in her first dress! She looked so cute in her Easter dress. Her arms are so chubby it is so cute! After a long picture session, we met my family at Papdeux, a cajun seafood restaurant. The food was so good. I had my favorite creme brulee for dessert. Frances was so good too. She didn't cry at all. She just looked around at everything going on. It was a lot of fun! I was supposed to take a class today at the gym when the instructor called and said it was changed to another day. Since Grandma was already here, I headed out to the LSS (a few actually). 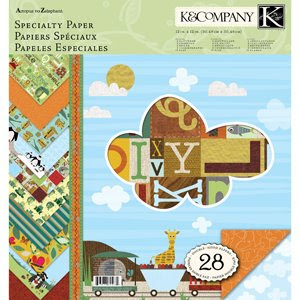 At my first stop I picked up this new paper that is so cute- the K and Company Actopus to Zelephant collection. It is so cute! I saw it and had to have it. 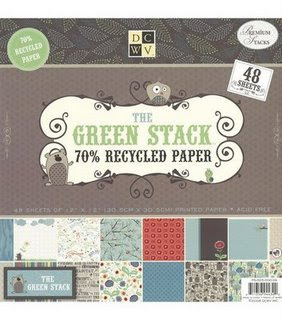 Then I stopped at another store and picked up the DCWV Green Stack. I love this one too! I love that cute is in right now. Everything is so cute with all these cute animals and designs. I then made it to my final destination where I would be scrapbooking. "Welcome Home" was the first page I finished. I tried some new things on this one. 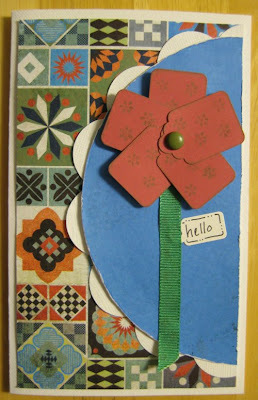 I made those cute little flowers from my Sassafras patterend paper and decided not to mat the pink paper on cardstock. I really like how it turned out. When I got home and looked at it again I noticed the picture. It is one of my favorite pictures of Frances in her car seat when she came home from the hospital. Well my layout is all flowery and fun, but she is all bundled up because it was below zero when she came home! I still like it though. Then I made "Hello Daddy, it's nice to meet you." I love this picture of my husband talking to Frances. It's so sweet. I used my GCD Studios paper on this one. It seems like I am making a lot of one pagers lately. Frances's book is going to be huge! Oh yeah, speaking of GCD I won some embellishments at their DT party yesterday! I am excited to see what I am going to get. I'll let you know! Hello, hello, it's Monday and there is snow on the ground in Chicago! I woke up this morning and thought it was December. Pretty depressing for April. I spend the weekend at home with Ron and Frances. It was very relaxing. I made a few cards from my scrap bin. The one below is my favorite. So simple and cute. I hate giving it away! I had all the cards I made sitting on the hutch in my kitchen like a display and I heard my husband say- "These cards you made are nice, but what's up with this crazy one?" I immediately knew which one he was talking about! I told him it was for my mom and he said- "ohhhh." You see my mom likes everything I make. I could write happy birthday on a piece of paper and tell her it was a card I made and she would say "You made this? It's beautiful." So I am sure she will love the card ugliness and all. Come on, even ugly cards need love every once in a while. Am I right? I have to say this has been a crazy couple of weeks. I finally got serious about blogging and started this blog instead of using the one at scrapbook.com. 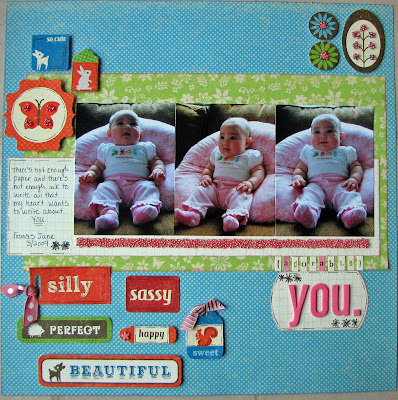 Then I wanted to get serious about scrapbooking so I submitted some of my work to Scrap That! for their Design Team call. I still can't believe I was chosen! It all happened so fast. I never really submitted my work anywhere. I just showed friends and got the occasional comment at scrapbook.com, but thought what the heck I will submit it for the design team call. I started Wednesday and it has been so much fun. The other design team members are so talented though I am going to learn a lot from them. So with everything going on I finally got around to fixing up the blog! I spent most of the night working on this. Ron took baby Frances and I have been tinkering with this thing ever since. I think I finally have it how I like it. No more generic blogger template! Hurray. I was getting a little embarrased. Let me know what you think. Have a nice weekend. 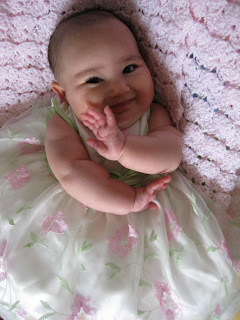 I will be around cleaning house, scrapbooking and taking care of baby Frances. 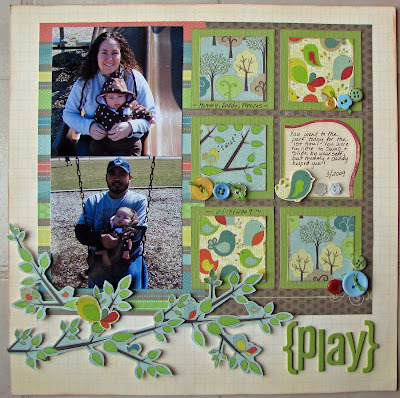 April Design Challenge at Scrap That! My first challenge as design team member is posted on the Scrap That! forum. Please check it out and join the fun! Scrap That! 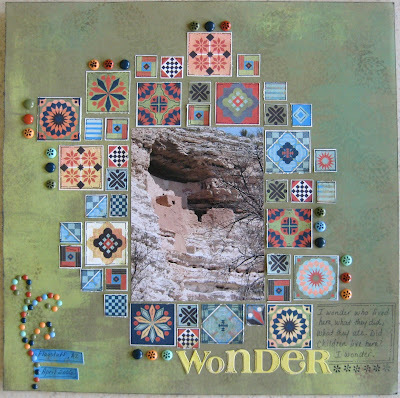 is a great place to meet other scrapbookers, find inspiration and have fun. I have been chatting with all the girls this week and am having a blast! And the projects are amazing. You will find so many great ideas. 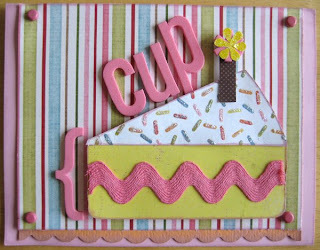 Make a card or scrapbook layout (1 or 2 pages) with a word/picture combo for the title or sentiment. Go to http://scrapthat.ning.com/forum/topics/sarahs-april-challenge to find out more and see the other design team member's challenges. And have a great Friday! Weekend is almost here! My exciting news - and it isn't an April Fool's joke! I applied to become a design team member for a great little online scrapbooking store called Scrap That! and I just heard yesterday that I was one of five ladies chosen! I am so excited and can't wait to start designing for them. My kit for April is in the mail and then I can start designing with it. I will have my first projects as a design team member posted on Scrap That! soon. Please come by and check them out.